If you insulate-winter-compost, you can keep it healthy, well preserved and ready for your Spring flower and vegetable gardens. 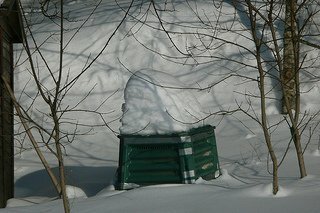 Wouldn't you love to compost during the winter too? Often wonder what to do with the same scraps you have all winter long, but it seems like there's nowhere to put them? Many would like to continue the composting process but figure it's rather fruitless especially if they reside in harsh cold climates. 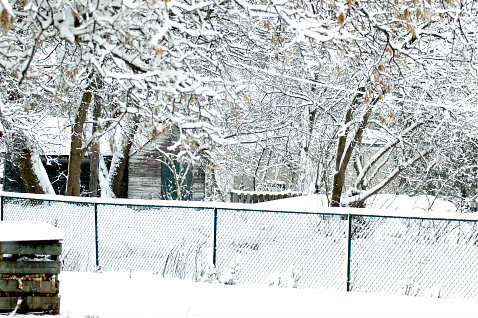 How do you get to the compost heap in the frigid weather and waist-high snow? Who wants to walk out there? Most people just abandon the idea completely and wait until Spring to start-up the compost heap again. Well, you don't have to do this necessarily. Even if you don't have a system indoors (and maybe you don't want one either) you can still keep your compost pile going and take care of it too. Cold weather gardening is do-able especially for the die-hard gardeners who miss getting their hands dirty in the warmer season. Actually, your compost will benefit by being properly taken care of over the winter months. I bet you didn't realize this, but it's true. There are ways to keep the heap going and look after it over the winter months. Insulate-winter-compost. It's well worth it in the colder months and there are many reasons why to do this. If you can't do it inside, you can in fact still do it outside and you won't miss that "gardening experience" you enjoy so much. Your houseplants enjoy the benefits of the food that comes from composting all spring and summer don't they? They can enjoy the boost during the winter months too. Compost heaps that are kept going over the winter, won't overheat or dry out like they do in the summer. It's a little less work actually. Insulate-winter-compost during the cold months and you'll see good results to help it stay "healthy." Not sure how to do this? First of all, take out as much of the rich compost that has accumulated over the Summer. Any new compost you put in won't break down very quickly in the winter, so you don't want it to pile up too much. If it can be moved at all, now is the time. You may have a garage or other type of building to put it in if it's in a bin and/or moveable. Consider doing this, but if you can't, you can't. You could dig a hole and throw it all in there. While doing yardwork like raking and trimming, take the leaves and trimmings and pile it on top of the hole. Just being in the ground surrounded by dirt is very good insulation. Have a bin or is everything in a pile? Lots of mulch and straw is an excellent way to insulate by piling it on top of the compost heap. I usually ask neighbours after Halloween for the straw-bales they used for Halloween or Fall decorations and they happily give it away if not using it themselves. Great for protecting the rhubarb, the compost heap and any type of garden you have. Speaking of Halloween, got lots of potato chip cartons leftover that held the Halloween treats? Cut up the boxes and make a heavily layered wall of cardboard around the compost. If you had lots of leaves or leftover straw this makes great insulation stuffed in between the layers of cardboard. Insulate-winter-compost and that will also help to conserve the worm population in your heap if kept warm enough. They do like to go deep into the compost and the warmer the temperature, the better as they will die in extreme sub-zero cold. The snow itself is a wonderful way to insulate. When thick and piled high enough, anyone will tell you that it's a great source of home-made insulation directly from Mother Nature herself. Make sure you have the accessible path to your compost. temperatures. So, put the pile (if moving it) as close as you reasonably can to your house. Try and make time to keep a path cleared to make the trip outside. A type of bin kept in the kitchen will hold your daily scraps and every few days, take it out to the pile and throw it on. And once Spring arrives again, just remove what insulation you used like straw or pieces of cardboard to avoid the heap from getting too warm. It now needs fresh air and a good turning. Your compost will have been fed all winter and it should be in good condition. Compost rich in nutrients will be ready once again for your plants in the garden.